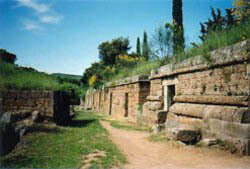 The Etruscan Necropolis at Cerveteri is a uniquely haunting archaeological site. Built by this prosperous people between the seventh and the third centuries BC, the 'city' is still not fully excavated, but there are a remarkable number of stone tombs lining little streets, and you can easily spend several hours exploring. The enigmatic Etruscans built cities and ports that have long since disappeared, but the care and industry they put into the homes for their dead has resulted in a lasting monument. The experience of clambering inside these tombs is unmissable... it's also rather eerie and feels faintly invasive. One hopes that, unlike the pyramids of Egypt, there are no curses here to blight the adventurer. 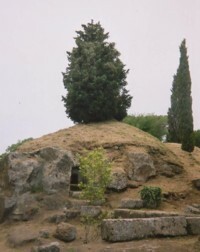 The Banditaccia Necropolis site, a short distance outside the small town of Cerveteri, is huge and surprisingly bare of visitors. You can wander as you please - and take a torch. The major tombs are signposted, have steps for access and lights for illumination, but the majority of interiors are accessible only to the intrepid. There are distinct types and ages of tomb. The majority contain stone 'beds' with carved pillows, some also provide what seem to be stone chairs. There are round tombs, square tombs, posh tomb development and streets of terraced tombs. Most are bare inside; although some coloured paint is visible in places. The Tomba dei Rilievi contains appealing painted reliefs. The best finds from the archaeological digs are mostly in Rome, in the Villa Giulia Etruscan museum. But the smaller museum in Cerveteri is worth a look. It's in an old castle on the main piazza close to the bus stop. You may need to ring the bell for admittance. Entrance is free, and you can admire Etruscan art and artefacts found locally, including the contents of some of the tombs. The modern town of Cerveteri is nothing particularly special; there's a charming central piazza where you'll find the main municipal building and the museum. This is in the old town on top of the hill (by the bus stop), and there are also a handful of pleasant streets with shops and eateries. It's a small place; the more modern developments are on the plain below. To get to Cerveteri from Rome by public transport, you can take either the train (to Cerveteri-Ladispoli station, then take a local bus) or a COTRAL bus (journey time approximately one hour). The COTRAL buses are probably handier, as they stop right in the centre of town. Buses leave from Lepanto Metro station (Linea A); the bus stops are just above the underground station, and there is a ticket desk below ground. A tip: on the way into and out of Rome, the bus may be stuck for a long time in traffic. If you can avoid this by using metro stations further along the bus route, do. The bus stop in Cerveteri is handy for the museum and the old part of town. The necropolis is about 25 minutes walk from town along country roads. To get there, follow signs, heading downhill and to the right. It's easy to find the way, and the walk is undemanding; but the less mobile should be prepared to take a taxi to the archaeological site. There is a bookshop, a bar with some food, and a picnic area inside the archaeological site. There are also some nice places to eat in town; a good idea is to arrive before lunch, eat in Cerveteri at one of the restaurants near the bus stop, then spend the afternoon at the ruins, before returning to Rome.